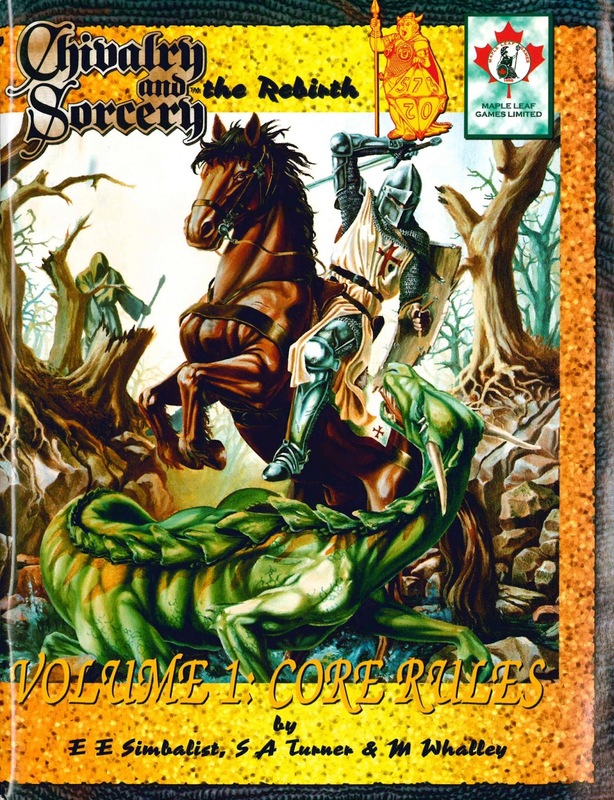 Chivalry and Sorcery (C&S) is an older game system first published in 1977 (Red Book) by Fantasy Games Unlimited. A second edition appeared as a 3 volume box set in 1983. It changed the focus slightly by removing the tabletop wargame rules for medieval battles using miniature figures which had been part of the "complete system" of the red Book. In 1997 a third edition of C&S was released with most of the references to the historical middle ages removed. This edition focused on fantasy tropes mostly drawn from the work of J.R.R. Tolkien. The fourth edition (The Rebirth) reinserted some of the medieval material from previous editions. C&S has been a somewhat controversial game from the start. 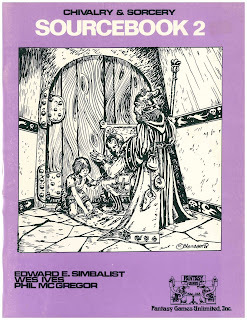 The first draft named Chevalier was created by Ed Simbalist and Wilf Backhaus as a more realistic version of TSR's White Box. The authors state in the first edition that they wondered what their characters were doing in between dungeon adventures and thus began their work on a more "realistic" system that reflected many aspects of the historical middle ages including feudalism, chivalry and the monotheistic church. This allowed them to follow the non-dungeon advancement of their characters. The first edition (Red Book pictured above) was published by Fantasy Games Unlimited in 1977 and was billed as the complete game system. In C&S magick (always spelled with a "k") is present, but relies heavily on concepts drawn from historical sources - think Tarot cards, the Kabbalah, alchemy, astrology and witchcraft. The fantasy elements borrow heavily from J.R.R. Tolkien's Middle Earth, and although hobbits, elves and dwarves are mentioned as possible player characters, they can seem downplayed in favor of a more realistic, historical approach to the game setting. 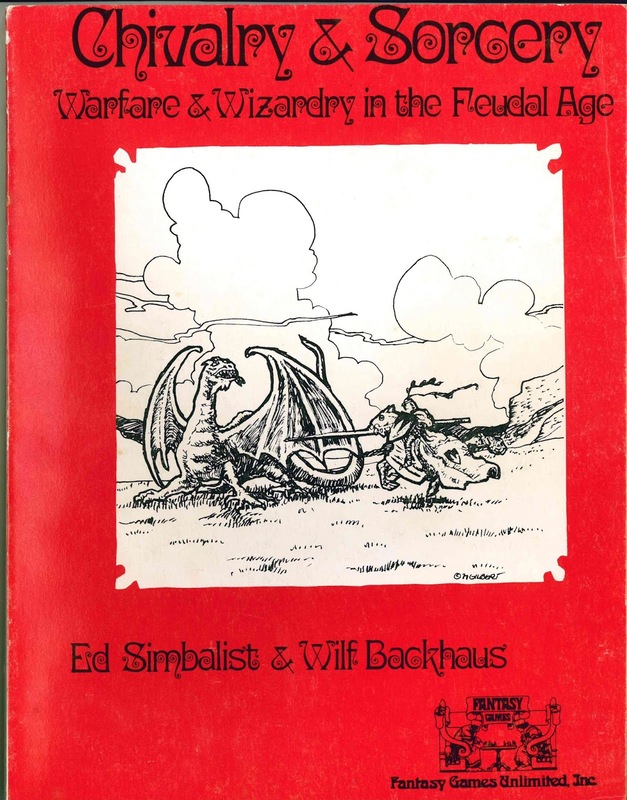 I get the impression the authors may have had more interest in history than fantasy literature, which can explain the differences in emphasis between C&S and the Original Fantasy Role-Playing Game. 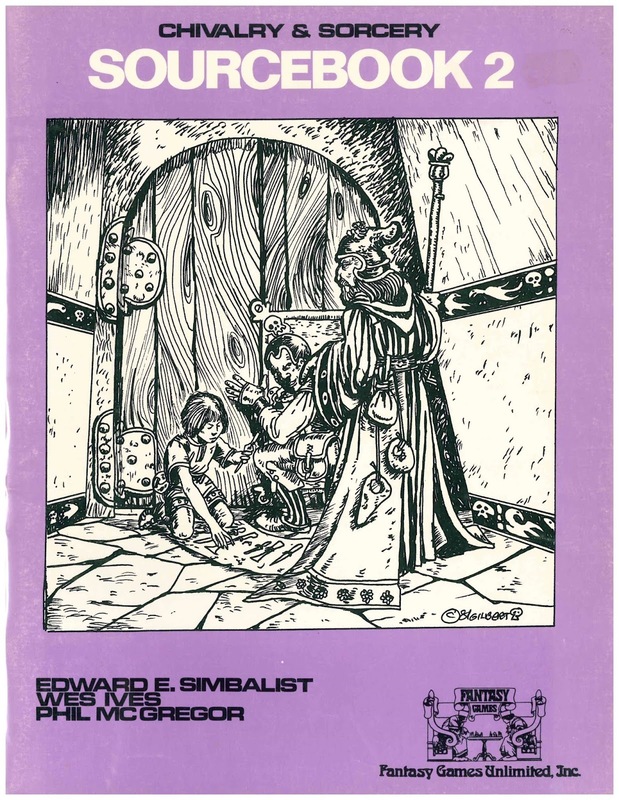 In many ways the C&S first edition is a study in feudal European history in the form of a role-playing adventure game with some fantastical elements added, perhaps in order to market a "complete RPG system". Being a history buff and avid role-player (who also enjoys fantasy stories), C&S appeals to me in all its editions. In keeping with a realistic approach to the middle ages, feudalism with its rigid social hierarchy and limited upward mobility is a central theme in the game and affects play in several ways. Players may take the role of a serf or peasant (rolling randomly can produce such), but this severely limits the PC's freedom and access to wealth. It is suggested by the authors that the GameMaster (a term possibly coined by them) start all characters as members of the knightly class who therefore have access to better weapon training as well as more personal freedom and the ability to form relationships with the more powerful nobility while rising in social rank. Traditional warrior knight, church clergy or adept dabbling in magick are all careers which the character may pursue and which cast PCs as members of the feudal society. 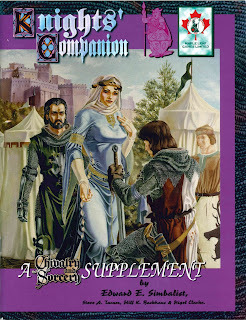 The authors of C&S point out the limitations of the dungeon as a basis of play and encourage the game master to develop a world based on an historic model (they suggest a version of medieval France which they themselves use). Tournament, chivalry, courtly romance, fealty and the medieval Christian church provide PCs with reasons to adventure and can play a bigger part in the game than the traditional fantasy conflict of good verses evil (Law vs. Chaos), although that is certainly a part of the game as well. The Red Book uses an alignment system based on law and chaos scores along a numerical continuum (1-20) with the low end being lawful behavior respecting religion and social institutions. The authors describe "places of mystery" where monsters and treasure may be found in the fantasy campaign. These are described as ruins, enchanted forests, faerie mounds and the like (fantasy "dungeons" are denigrated as impracticable fabrications). The "fantasy campaign" is presented as one way to play C&S, but not the only way. Suggested monsters, like magick, rely heavily on historic sources and the work of Professor Tolkien (with a nod to R.E. Howard and Fritz Leiber). This gives C&S a feel quite different from White Box. (Apparently, the game presented in White Box has more widespread appeal as evidenced by its success.) C&S is a niche product, but one with a devoted following as evidenced by the number of revised editions that have been published and its influence on later settings and games such as Harn/Harnmaster (and possibly RuneQuest which promotes a similar "immersion" within the game setting). Over the years and editions there have been several sourcebooks and supplements for C&S. The first for Red Book, titled simply Sourcebook, adds the Forester as a player character type and contains a rather extensive article on wilderness adventures including several detailed random encounter tables. The Sourcebook also contains an extended discussion of magick and siege warfare. Realism as a basis for the game's mechanics remains a central theme throughout C&S and the Sourcebook includes a resource article on medieval economies which takes an historic look at commerce and coinage and is useful information for many campaign settings of a fantasy nature. (Scarcity of coin and reliance on barter can give a milieu a realistic feel and knights and nobles require peasants to feed them.) The material in Sourcebook is interesting and useful well beyond C&S. It can inform any fantasy role -play experience. 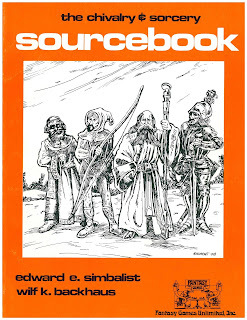 The cover illustration on Sourcebook 2 (copyright 1981) suggests something about doors and locks and indeed inside are articles on doors and locks with several extensive tables on their construction and in-game statistics aimed to help the referee determine just how long it will take a stout fellow with a wood ax to cut through that dungeon door. Overkill, yes, in my opinion this is not something I care to go into detail about, but here it is in "official print". I do wonder how others have received such articles? With tongue in cheek? Maybe? Sourcebook 2 also includes more on the subject of magick, including a number of random tables to help determine just what spells an NPC magick user might know. An article or two on taking the miniatures rules to the strategic level, including siege warfare. There are also articles on weapon smiths and magic items. The supplement Swords & Sorcerers adds popular Viking culture as a player character option along with the Mongols and Celts offering the C&S game master cultural material to broaden the scope of the setting and to explore role-playing outside feudal Europe. Each culture described has its own magick elements connected to historical tradition while remaining consistent with the way C&S generally approaches magick. Included are some cut-apart rune cards for use with the Viking wyrdsmith. The Knights' Companion is a supplement for 3rd edition C&S that discusses feudalism, chivalry, courtly love and heraldry, all from an historical perspective. 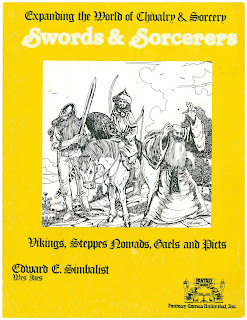 With much of it written by original C&S author Edward E. Simbalist, The Knights' Companion once again demonstrates the emphasis Mr. Simbalist places on roleplaying as a way to explore a setting soundly based on an historic societal model, in this case feudalism. From the beginning C&S has been about roleplay in a realistic feudal milieu where expectations of character behavior are based on birth and social class. A significant part of the challenge and enjoyment for roleplaying in a setting based on feudalism, or any other society vastly different from our own, is making decisions about your PC's behavior consistent with the game setting society. In other words, playing a knight in a way that seems consistent with our understanding of knighthood and feudalism. To that end, doing a little research into the history of European feudalism seems appropriate. So what do I think of Chivalry & Sorcery? Although I have only played the game twice (2nd edition in the mid 1980s), I continue to collect the old volumes and they are frequently reread. I enjoy the idea of C&S (and role-playing in a realistic feudal milieu) immensely. The problem is that the system demands a devotion to history and a medieval mindset that is extremely alien to most Americans. In many ways C&S is a simulation study within a game. The King Arthur Pendragon and HarnMaster rules are similar in that the referee and players have to be willing to confine their play to be consistent and believable with regard to a perception of what the medieval European society was like (maybe with some Tolkienesque fantasy tropes thrown in). As a student of the middle ages, I love the idea of gaming in this period. (The most success I have had with something similar is running Call of Cthulhu set during the crusades.) I don't mind solo gaming, but to get the most from a game like C&S it needs to be a group experience. (This isn't a dungeon delve, which can be done solo.) My favorite C&S edition is Red Book - 1st edition. It seems the original authors are more straightforward in what they are wanting the game to be and although the print is quite small, the material in the Red Book seems more complete with the miniatures game included. I can also hear the author's voice more clearly in the 1st edition text giving me a more personal connection which I enjoy. 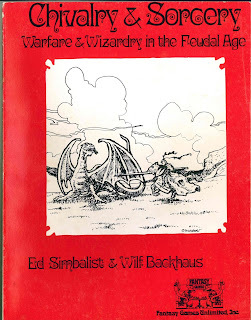 I never met either Mr. Simbalist or Mr. Backhaus, but I do appreciate their take on gaming and their contribution to the hobby.